On July 1st, 2018 Tennessee Lawmakers passed bartering bill HB1728 sponsored by a Republican member of the House of Representatives Cameron Sexton allowing uninsured patients to barter goods or services in exchange for health care. Maybe this excerpt from the Alaskan Bush People on the Discovery Channel can shed some light on how bartering for Healthcare just might work…. According to the Tennessee Justice Center, there are over 300,000 Tennesseans that don’t have access to health care coverage. The non-partisan group is calling for lawmakers to lift the 2014 ban that bars the governor from using federal funds earmarked for covering uninsured working families. Many believe that Tennessee should join the other 33 states including neighbor Arkansas who has taken advantage of the affordable health coverage through the Medicaid expansion program. In recent months Tennessee has been ranked the highest in-hospital closures per capita of any state in the nation. With the number of hospital closures on the rise and individuals struggling to pay their hospital bills that number is expected to grow. What does this mean for those who love to barter and trade? This new law has physicians and patients scratching their heads. Bill H2178 may not be the total cure for the Tennessee health care crisis. However, it does open up the discussion on bartering for services, if presented right. Imagine people showing up at the doctors office with goats, pots and pans, and other stuff wanting to trade and barter. If you’re a Doctor or other Healthcare professional that thought may be a bit frightening. On the other hand, for the savvy trader or barter company owners, who understand the benefits of bartering this could be a tremendous opportunity. The Tennessee Medical Association which is the state’s largest professional association for physicians sent out a message and updated their website announcing the new law. So, now may be a great time to reach out to local Healthcare Professionals who may be interested in finding out if and how bartering could benefit their business. The reason that now is the perfect time to do this is because they have been made aware of bartering (BY A LAW) now their opinion of it may need to be shaped and that is your job! 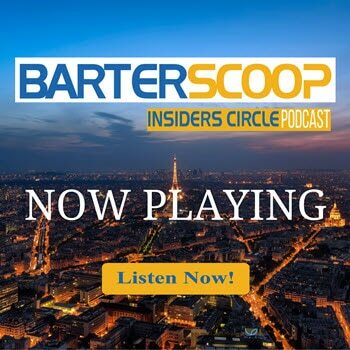 So reading articles like this and listening to the BarterScoop Insiders Circle Podcast will educate you on the benefits of bartering and help you present win-win solutions for both you and your Healthcare physician.